Boost E-commerce newsletter is a responsive email template that has been designed to be used for creating newsletters for e-commerce companies. The template is quite engaging when it comes to look and feel and is also equipped with options that are much needed for e-commerce business. Fitted with a template builder tool, the pre-defined templates can be modified and new ones can be created by using drag and drop feature. Boost E-commerce newsletter template is multipurpose template and can be used to create newsletter for other businesses as well. The design layout of the template is such that you can add a lot of relevant content in the newsletter without making it look stuffed or cluttered. Among the many pathbreaking features, the template is completely mobile-friendly. In order to let your email reach all mobile and tablet users, we provide templates that are fully responsive. The templates that you create using builder tool are also truly mobile-friendly. We have designed Boost E-commerce Newsletter template in a way that it is completely compatible with MailChimp, which is the most popular email service provider. Campaign monitor is among the most widely used tools to monitor your email campaign. 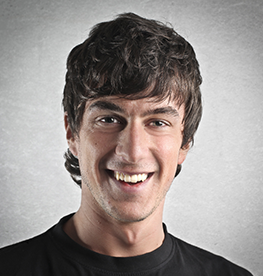 We have built our template to be compatible with Campaign Monitor in all respects. 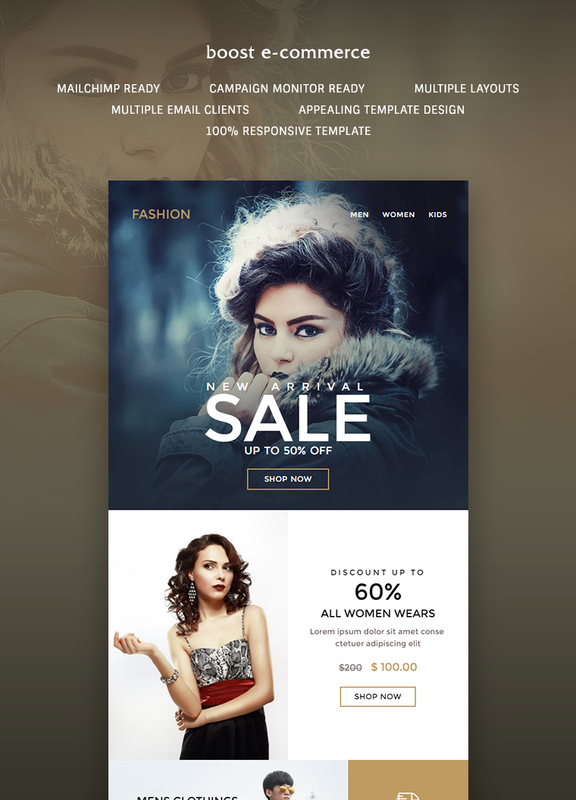 As the template is meant for e-commerce, especially online fashion storefronts, we have given the template a cool hipster and vintage look and feel to make your emails look amazing. You will never run out of the layouts to be chosen as the newsletter design, as we have provided several of them. Just choose the one that best suits the campaign. Boost e-commerce newsletter template can be used to create emails that are displayed on all major email clients including the native Android mail and Gmail apps. 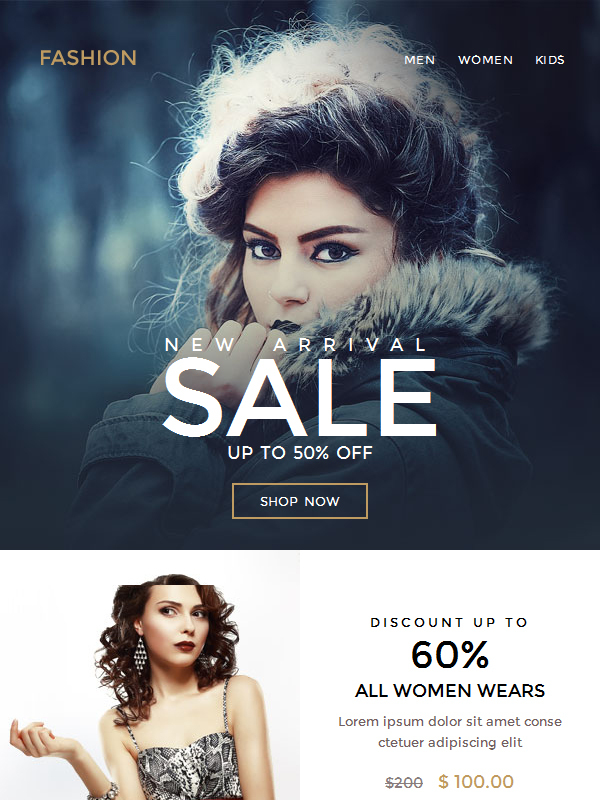 Crafted by adroit designers and developers, Boost E-commerce newsletter template is an email template package that comprises well layered PSDs and access to a builder tool. Built in vintage style, the template is ideal for fashion portals, fashion blogs, e-commerce websites and many other businesses. We write optimized, well-commented and validated code for our templates so that their performance is top-notch and is free from all kinds of bugs and errors. Although Boost newsletter template is designed to be fit for e-commerce business, there are different layouts that make the template quite versatile and hence, can be used for other businesses. In order to let our customers make the best use of this responsive email template, we have prepared help document that contains the detailed explanation of the template’s various features. We have designed the email template to be user-friendly in terms of implementation, editing, compatibility with other email service providers and email clients, etc. We make sure that the compatibility issues of your business email do not affect your success and that is why we get our email templates tested for all environments. In case, you face any trouble while editing or displaying Boost e-commerce newsletter template, we provide technical assistance and resolve your queries at the earliest.